Live Out Ur Dream – Godrej LOUD! Coming to XIMB, I had no prior knowledge about the Godrej LOUD program. Being the first major event of the academic year, everyone at XIMB was gearing up for LOUD on 8th August. Keeping itself away from quintessential b-school competitions, the concept of LOUD was exceedingly simple. “In Rs 1,50,000, what will you do to fulfil your dream”. 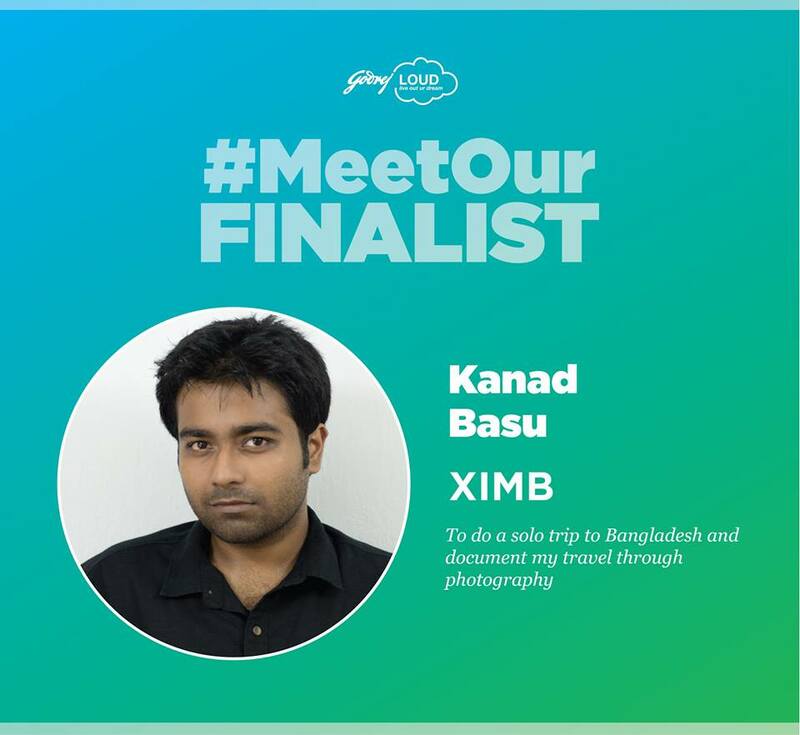 Being a dreamer from an early age, I knew I had to be a part of this and all I could think of was my childhood dream of visiting Bangladesh where my grandparents were born. Finally, the day came. I was elated beyond measure when I found out that among the many submissions, my video was selected from XIMB for the National round to be held on 29th August 2017. After that, until my journey to Mumbai, I worked on my presentation for the national round. I would like to take this opportunity to thank my seniors and classmates who helped me prepare for this mega event. But even after all the help and preparation, a tinge of nervousness and apprehension remained inside as the day crept closer. I reached Mumbai on 28th August, the day Mumbai received its heaviest rainfall of the year, and reported straight to Godrej One, the company HQ at Vikhroli, Mumbai. Upon arriving, I met with the HR team. I along with other contestants, practised until 6 pm before the HR team while receiving valuable inputs on improvements. Taking a break, I roamed around the Godrej Campus clicking photos which I had planned to include in my presentation. By 8 pm I was back to my allotted guesthouse and started with my practice for the next day. 29th August. Finally, the anticipated day arrived; I reached Godrej Campus at 9 am. Upon arrival, the dry run started immediately in the auditorium where Vandana Scolt, the Head – Communication Design at Godrej Industries Limited, suggested a few more changes in our presentations and pitch. By 11 am, Godrej started with interviews of all the contestants where we were asked about our respective LOUD dreams. At 2:30 sharp, the main event commenced. Attending the event was such a delight and an experience of a lifetime. The finalists ranged from rowing mavericks to singing enthusiasts. To witness all the multifarious talent, energy, and dreams under one roof was unbelievable and inspiring. I was third in line and as I was waiting for my turn to come, a concoction of excitement and nervousness was engulfing me as this was the first time I was participating in a competition of this magnitude. The dream is very close to my heart and hence I was afraid to make any mistakes. Finally, my name was called. Carrying a mixed bag of emotions, I went to the stage and talked about my dream, my inspiration and my story. Despite my misgivings, my presentation went well. I was a little apprehensive about my shot at winning, considering the tremendous talent pool. But after the event, when my name was declared as one of the winners, I was euphoric beyond measure. After the declaration, the mandatory cake cutting ceremony took place. An after-party was scheduled for the evening but due to torrential rainfall, it had to be cancelled and we were all escorted back to guest house. My interview for the internship was scheduled on the very next day which went on quite smoothly. I was delighted to discuss my dream, personal motivations as well as professional aspiration with Godrej Business Heads. Right after my interview, I had my flight to Bhubaneswar. Overall, my stay was amazing. I went back to my college, carrying beautiful memories, new friendships and my dream of visiting Bangladesh now on the verge of becoming a reality.